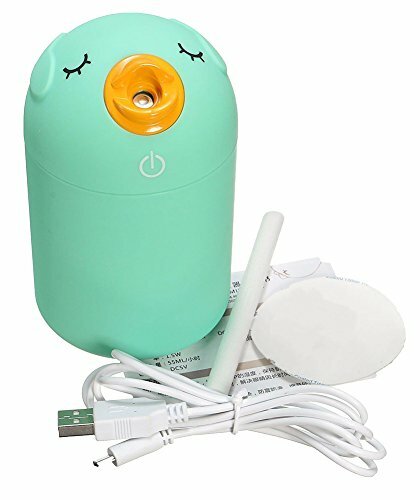 Gracefulvara Mini Cute Bird Ultrasonic USB SPA Humidifier Green by Gracefulvara at My Natures Treasures. Hurry! Limited time offer. Offer valid only while supplies last. Please read the product description carefully before buying! If you have any questions, please contact us in time, we will reply you the first time. 1. the ultrasonic vibration to form fog. 2. fog particles can eliminate static electricity, reduce computer screen radiation damage to the eyes. 3. reduce dust hate smoke pollution in the air, improve air quality. 4. increase the humidity in the air, flaky skin. 5. Fog particles can eliminate static electricity, reduce the computer radiation, resolving the dry eyes see computer for too long, improve the surrounding environment, make breathing more health. 6. The silicone ring leak prevention design, equipped with silica gel at the bottom of the mat, shockproof non-slip, detail place embody humanization. 7. The humidifier can not add incense or essential oils! The first leg switch continues to spray, the second leg intermittent spray, the third file closed.